When I was fourteen years old, I had an accident in which I lost a significant quantity of blood, and subsequently I had to receive several blood transfusions. What happened is that there was a student revolution in my school in Argentina. The kids all hated the principal, who was very repressive and would use wanton violence to control and discipline us. The oldest students pooled their money and bought rat poison smoke bombs, very toxic, and gave some to many of the younger kids, showing them how to light them, and telling them to throw them in through the windows of the school. It was instant mayhem. Day after day classes had to be canceled due to those smoke bombs. Some even got thrown inside the principal’s office, and boy, did he have smoke coming out his ears! With this totally outrageous behavior we were able to stop the classes for two full months until the government finally intervened, expelled two students, fired the principal and hired a new one. Anyway, two weeks into our revolution, one day all the students and teachers were running out of a classroom to escape from the poison smoke bomb which had just been tossed in, and a friend jokingly closed a glass door just as I was approaching, his intention being just to hit me with it. I put my hands out to stop the door and the glass broke, cutting both my wrists very badly – blood was shooting up a foot in the air, like a fountain! The history teacher wrapped his shirt around my wrists and drove me to the nearest hospital, a real rat-hole of a place – it was the hospital where convicts were brought from the local jail. I was there on a ward with more than a hundred inmates for a week, sleeping next to thieves and murderers, and even became friends with some of these rascals. My father was in Costa Rica at the time, and my mother wasn’t well, but braved the danger of a few visits during visiting hours anyway. I needed pills for the pain, since many nerves in my wrists had gotten severed, and one afternoon some of my ward mates jumped the male nurse, sticking spoons into his neck until he finally gave them all the pills he had – a huge bottle! When he went running from the room, they gave me a few pills and then each took a large pile of pills for themselves, everyone popping several right away. Within ten minutes the police sirens were wailing outside, and suddenly all the pills got hidden inside my pillowcase, so my mugger pals wouldn’t get more jail time for their new misdeed. The pills in my pillowcase went undiscovered, and the police just slapped a couple of guys, made some threats and left. The rest of my time there everybody on the ward was happy as a lark and feeling no pain. I now realized that I had probably received the hepatitis through the blood transfusions I got on the day of the accident. At the time I was told by a nurse that transfusions are very risky, and often carry hidden diseases, so I would have to be careful to monitor my health in the future. Although my injury seemed like a tragedy at the time, it was actually the greatest gift I had ever received, for in its own way it woke me up to something beyond time and death. The fear of death from some blood-borne disease emerged as the most authentic feeling I’d ever had, and I abruptly lost the feeling of invincibility most young people have. And yet, facing the possibility of death somehow brought a sense that eternity was kissing the depths of my soul. This feeling was coming not from an individual me with a human identity; something higher and vaster than any individual was making this clear. But along with this contact with eternity, I also experienced at times an abysmal all-encompassing emptiness. Now, in my early twenties, the disease which had been incubating in my bloodstream since I’d gotten the transfusions was wreaking havoc in my liver and poisoning my entire system. At the time there was no known treatment for hepatitis C. The first doctor I saw told me that the percentage of cures for this disease was very low, and that there was a strong possibility that I would not live for long. The hepatitis was apparently unrelated to the tachycardia, which had been caused by excessive use of that breathing exercise. Karmic double whammy! While the tachycardia gave me too much energy, more than my system could handle, resulting in muscle spasms, panic attacks and hallucinations, the hepatitis C drained me of all energy, making me an exhausted and depressed prisoner of a dull and dying world. After that doctor’s appointment I spent most of my free time alone, pondering death and thinking about Sufi Baba’s attitude. It was obvious, however, that I was not prepared to face death with the same kind of faith and courage he had. I spent months engrossed in a morbid obsession with dying; it was my only object of thought. I never complained to others, but internalized my experience, and I noticed that my ego and personality were beginning to crumble as I contemplated my impending demise. Existential questions ran through my mind like a babbling brook: What will it feel like to leave the body? Which part of me will survive this annihilation, if any? What will happen to my memories? What will happen to the people I leave behind? Is this the end of me? Sometimes I wanted to cry and scream, and feelings of impotence would drown me. But once in a while I would remember the dying Sufi and his amazing attitude, and that would save me from the depths of despair. I spent the next several years trying every possible medicine and healing technique available, and after many deceptions and failures, my faith in the available medical therapies began to crumble. I completely lost all my confidence in everyone who had been offering me advice and guidance, and I began just ignoring the many different opinions that were bombarding me. In my despair, I finally decided that the only one who could find the right way to heal myself was me. I had to be my own doctor. I began to believe in the power of my own intuition and started exploring my own sense of what could bring healing. I recalled my earlier experiments with fasting, and decided I should try this as a way of curing the hepatitis. When I told my naturopathic doctors that I was strongly considering doing a long fast, they strongly advised against it, and tried to scare me with stories about the negative side effects of fasting, and even presented me with research studies which concluded fasting could be harmful or even fatal. My family members were strongly against it, and even my friends were unsupportive – I felt as if the whole world was against the idea. Nevertheless, my intuition was definitely telling me that fasting was the right way forward, and I rationalized my intention by convincing myself that I had nothing to lose. I was already feeling terrible, the hepatitis was probably fatal, so even if I died fasting, at least I would die in a transcendental way! There is only one thing more powerful than all the armies of the world, and that is an idea whose time has come. I suddenly knew with total clarity that it was time to fast. I felt fully committed and ready to dive in! I started with a simple decontamination fast: three days of nothing but juices. It felt great. Vaishnavi was surprised, and happy that I’d found something that helped at least a little. I was cautious and did more reading, and then did another short fast, then another and another. I never rushed into a new kind of fasting recklessly, but kept researching cautiously and unhurriedly. A new approach emerged, which was to purify my liver and gallbladder with a flush that involved drinking apple juice with phosphorous drops for four days, concluding the cleanse on the fourth day by drinking eight ounces of olive oil. The olive oil made me feel terribly sick, but for one night only. And the next day, after passing many gallstones, I felt exceptionally good. That day I knew for certain I was on the right track. I started to experiment with various approaches to juice fasting: I tried one, two and three-day fasts, and then did one for a week. In my research I discovered the Master Cleanse, which involves drinking three glasses a day of lemon juice combined with as much water as you want, sweetened with maple syrup and spiced with a healthy dash of cayenne pepper. I tried this cleanse for 21 days and really enjoyed it. While the first few days were difficult on any fast, generally after the tenth day I noticed transparency of mind and sharpness of thought, together with increasing liveliness and stamina. So I knew I was on the right track. After this fast I did a blood test, and discovered that my viral load had dropped way down. All of my hepatitis symptoms disappeared completely for several months! Fasting was the only technique which brought forth such positive results. After the 21-day cleanse I felt so good that after a few weeks of eating normally I decided to try a 40-day fast. A week or so into it, I began feeling joyful, optimistic, relaxed and serene; this allowed meditation to happen effortlessly. Fasting was not only physically beneficial, but a spiritual blessing also. When the 40-day fast was over, after a short break I decided to do a 108-day fast, only on water. Asking permission from no one, I jumped right in. I was already very thin from my previous fasts, and Vaishnavi was dead set against the idea and strongly protested several times. 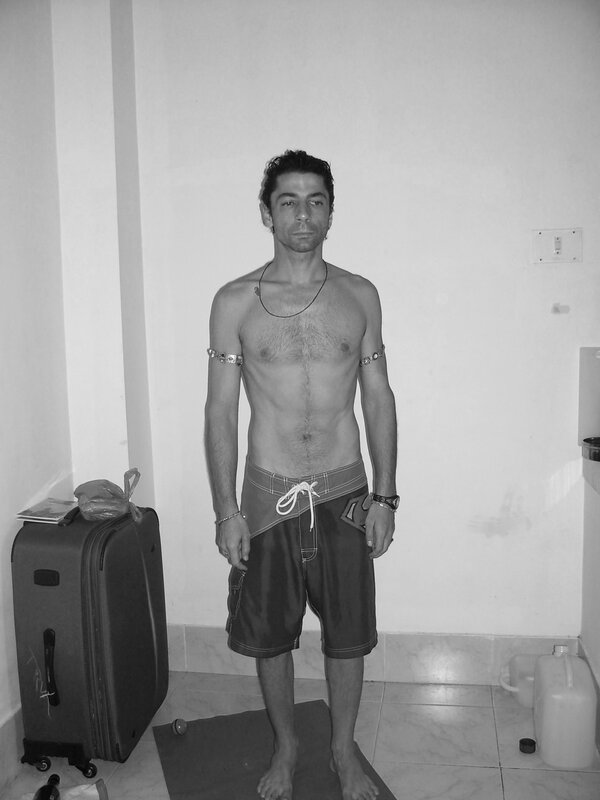 My friends, doctors and yoga teachers were also asking me to stop, and when an old friend who I had not seen for a long time met me on the street, he burst into tears at the sight of my emaciated form, thinking I was dying. But I was one stubborn case, and refused to stop. I was feeling great. Vaishnavi and I had a big fight about it, and finally she decided to go to Hawaii and spend some time with a friend of ours there because she could not bear to see me so emaciated and refusing to eat. Nonetheless, when she left we were on good terms. We both felt that our connection was unbreakable: we were soul mates. Now that I was completely alone, I took the opportunity to go deeper into meditation. I pulled out of all work and started meditating fifteen to twenty hours a day, for twenty days straight. After 47 days of nothing but water, I even decided to stop drinking water for seven days, so I would not be ingesting anything at all. I didn’t do this for health reasons, but as an aid in transcending body consciousness completely in meditation. On the fiftieth night of my water fast – the third night of my absolute, ‘no water’ fast – at around 4:00am I was meditating in my room. Due to the fasting, I was hardly sleeping at all at that point, maybe two to three hours every two days. (Not being able to sleep is normal in long fasts, this begins to occur after twenty or 25 days.) 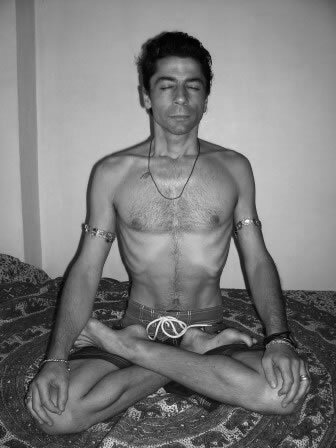 I had already been meditating for several hours, and I started to do some pranayama. This culminated in an amazing experience. The truth is it is simply impossible to verbally express the intangible experiences and feelings received while in a highly charged and spiritually elevated state. Commonsense rules of the senses, as they apply in the physical body, may not apply to astral experiences at all. Even though we have astral senses in these expanded states, they are altogether different from our physical senses. Anyone who has ever tried to write about spiritual experiences like this one will understand my dilemma. Nonetheless, I will do my best to put the experience into words. It was exceedingly dark, pitch black in the room, especially with my eyes closed. As I began the pranayama, I suddenly began to expand through an unfathomably deep, dark blue sky. I felt as if my physical body was gradually fragmenting, as an explosion devoid of sound took place, a Big Bang happening with my own being. On the one hand, the expansion period lasted eons; that was my experience of it. On the other, linear time ceased to exist and made no sense. I had no recollection of who I was, and no thought or memory of this world. It was as if the usually accepted reality didn’t exist at all – and had never existed. My individual history was completely erased and, along with it, any thought of family, friends, work, house and body all disintegrated into vapor. My personality disappeared. The sense of I, of me, of my ego, was blasted to nonexistent smithereens. Everything was gone. All illusions, vanished. I was the ether of pure Being and nothing but That: clear, transparent, invincible and ever fresh. The only reality was expansive blue emptiness, unknowable Vastness, and that alone was what I was. It was beyond clear that the so-called reality that we all experience is actually a non-reality. From the viewpoint of the Vastness, the world and universe we inhabit are just conceptual conglomerations of thoughts that, in some mysterious way, somehow attain the palpable illusion of material form and apparent volume – but have actually never existed at all. There were no traces of memory in me as an expansive force, indicating that there was nothing existing anywhere but me. I alone existed, as Being itself. For all eternity I was in that state, without a single alteration or modification. I had no need to experience change, no boredom, no wishes and no wants. It was a perfect state: expansive, joyous, omnipresent, all-pervading and all-powerful, with not the slightest trace of ego. I was not monitoring this condition; I was it. What we experience as objectivity and subjectivity made no sense in that state. There was nothing but Awareness without any object whatsoever. Objectivity and subjectivity were not only nonexistent concepts – if they had appeared they would have seemed ridiculous. And then, suddenly, objectivity became obvious. It started with the appearance of a black hole or vortex; I experienced this as a vortex of pain. In that state, I observed for the first time in my beginningless existence something separate from me – and from that first glimmer of duality instantly sprung forth the infinite array of multiplicity. Everything appeared within me: the whole world, our solar system, our entire galaxy, then innumerable other galaxies, and then other universes and other dimensions. I was the ground of all of it, the basis on which the totality of being and non-being existed. The whirlpool of pain grew stronger and more pervasive, and it started to disrupt my centeredness, as well as my connection with the universe. I could sense a foreign substance beginning to cover the freedom of the experience. The clear blue ether of my Self became tainted with dark clouds, but there was a specific cloud that infused a terrifying fear each time I connected with it, and for some strange reason I became hypnotized by the compelling force of this terrifying feeling. I felt a powerful vacuum-like force pulling at me, which I visualized as a long tunnel that enwrapped everything in that bizarre universe, including me. I was now certain that the short-lived non-dual experience I had just tasted was going to culminate in something dreadful. The immense power of attraction was unbearable and I heard a sound like howling wind, which gradually increased in volume. Particles of my infinitely expansive self began whirling around, captivated by that persuasive force. I refused to give in, tried not to be seduced by it, but the gravitational force of this vortex was incredibly intense. The battle between my pristine clarity and this vortex of pain seemed to last for eternity, all-pervading awareness of my true Self was forgotten, and I found myself tiny, bewildered and trapped, like an insect newly stuck in a spider web. And suddenly…WHOOSH! I was sucked in by the powerful vacuum effect of the vortex and became very long, stretched and thin. I felt some kind of intense mind deconstruction, as if psychosis, was invading my psyche like an occupying force. Images of earth jumped into my conscious field, and I saw something very bizarre which I could not distinguish, but for some reason caused deep sadness to arise in me. Suddenly I was surrounded by walls made of minuscule crimson bricks lining uninhabited cobblestone streets. I flew like a spirit down those streets, lonely and in agony, not knowing who or what I was. The streets became extremely narrow, barely the width of a normal sidewalk, with steep hills and sharp curves. The buildings beside me were very high and almost joined at the top, forming a kind of tall, narrow tunnel, and I was flying now at a great speed with no control over my direction or destination –something or someone other than me was dictating my route. I felt terrified. As I was approaching the end of this tunnel there abruptly appeared a blazing, green, semi-incandescent opening in the distance, apparently another tunnel. I felt a dislike for it, but was magnetically pulled in its direction with enormous force. Each time I resisted, some sort of deep emotional pain crawled up my amorphous physical structure – and this was not a physical human body, but a crystalline cocoon separating me from immeasurable space. Infinitesimal cylindrical channels pulsated through me like a nebulous nervous system. Finally I had no choice but to let go and surrender to the current… and was pulled into the green tunnel as if by a huge magnet. Flying through this tunnel at full speed, I was engulfed by green light, which seemed to have a numbing effect on the mind. After what felt like a long while, I noticed sub-channels branching off the main tunnel, and when I focused on any of them they would captivate me with great force. Finally, I felt inexorably drawn to one, a cylindrical transparent wormhole, and unperturbed by the intense gravitational pull I let go and relaxed. With immense velocity I flew into the wormhole, spinning this way and that as my trajectory took one sharp turn after another. Each new tributary took me through new feelings, emotions and reactions. In one channel I became fire, full of inexplicable rage; in the next I became water, cool and flowing, and then air – and as I became each new element I could feel definite changes of moods and emotions. and was slammed back into my physical body. I became Matias again, a mind-stretched, psyche-shocked, universally-kissed version of Matias, who would never be the same again. That glimpse of the Self – and the wild and crazy ride into physical form that followed it – had changed me forever. 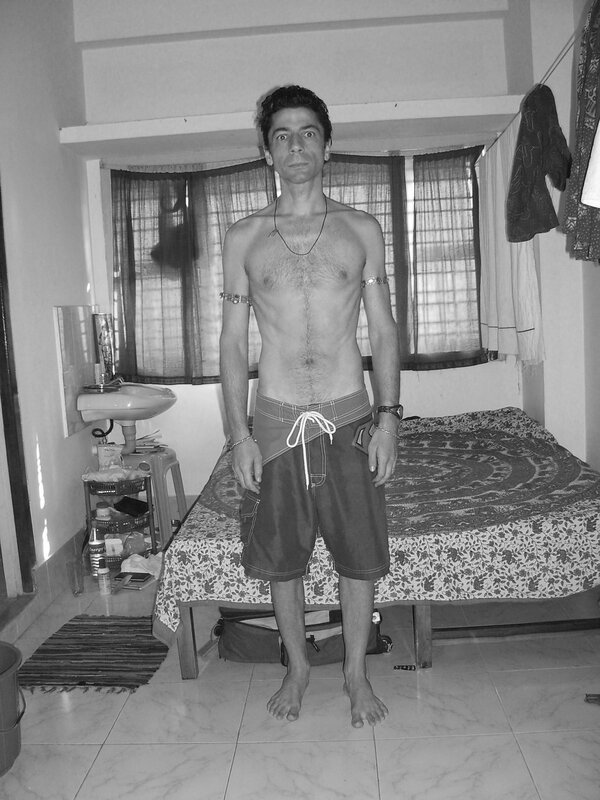 The next day Vaishnavi came back from Hawaii, to find me in terrible shape. After four days without even water I was seriously ill. My bladder had swollen up – I wanted to urinate but couldn’t, and I was retching continuously, as if my body was trying to vomit but had nothing inside to throw up. If I were not so close to death you could have called it a healing crisis. Vaishnavi urgently implored me to stop the fast. This time I felt that she was conveying God’s wish. So that day I started drinking water again, and after two more days of water I drank juice. I fasted for 54 days in all, exactly half the time I had planned. Interestingly enough, most Hindu malas(the beaded necklaces used to count repetitions of mantras) have 54 beads. The day after my fast ended I went to do a blood test. When the results came back, magic had happened. The viral load from the liver infection was at zero. I was completely cured of the hepatitis! After that, everyone gave me the green light for more fasting. For the next seven years in a row I did a forty-day Master Cleanse fast each year, and I’ve also done several long water fasts while at Amma’s ashram, and my health has continued to improve to the point where I am as strong and healthy as anyone I know. I am now a successful yoga teacher, and can teach all day without a break. Fasting is complete abstinence from food or drink for a period of time. Fasting for long periods is suggested as therapy for a variety of health conditions in different parts of the world. Fasting is also recommended for meditation purposes, it helps the practitioner to dive deeply in to his/her self. Most religions around the world recommend fasting to get closer to their gods and guides. Christians, Hindus, Jews, Jains, Baha’is, Buddhists, Muslims, Orthodox Catholics and more are great exponents of fasting. The person fasting can chose different ways of fasting; on the fall and new moon, one day a week, every other day, or for long periods like a week, month or even more depending on his/her needs. Intermittent fasting is a rational way of preparing the physical body for long fasts. If the faster wants to do a 20 day or longer fast, he/she should first detoxify their bodies by eating a diet consisting mainly on raw foods, free of complex carbohydrates, dairy products and sugars. The week before the fast he/she should take Epsom salts every other day to cleanse the intestines. Epsom salts works better than enemas. The fist long fast should include lemon water with Himalayan salt and baking soda once a day to make sure that the PH is balanced, since the body tends to become acidic. PH test papers could be of great help to monitor the faster’s PH balance. Sun Gazing and Pranayama are used by yogis to absorb energy during the fast. Breaking a long fast is a matter of great care; if not done with care, the faster could die. The fist food should be vegetable broth, or a soup with vegetables like blended carrots. The next day some cooked carrots and beets and some Epsom salts. After some raw foods, and slowly like this integrate other foods that are more difficult to digest. In http://www.gaianstudies.org/articles4.htm I found some of the benefits of fasting that made sense to me, and of course there are many more benefits than the ones portrayed there. permanently. There have been a number of intriguing clinical trials and studies treating numerous disease conditions with fasting. Here are some of those findings. * In one clinical trial of hypertension and fasting, 174 people with hypertension were prefasted for 2-3 days by eating only fruits and vegetables. They then participated in a 10-11 day water only fast, followed by a 6-7 day post fast in which they ate only a low-fat, low- sodium vegan diet. Initial blood pressure in the participants was either in excess of 140 millimeters of mercury (mm HG) systolic or 90 diastolic or both. Ninety percent of the participants achieved blood pressure less than 140/90 by the end of the trial. The higher their initial blood pressure the more their readings dropped. The average drop for all participants was 37/13. Those with stage 3 hypertension (over 180/110) had an average reduction of 60/17. All those taking blood pressure medication prior to fasting were able to discontinue it. Fasting has been shown in a number of trials like this one to be one of the most effective methods for lowering blood pressure and normalizing cardiovascular function. Blood pressure tends to remain low in all those using fasting for cardiovascular disease once fasting is completed. * Fasting is exceptionally beneficial in chronic cardiovascular disease and congestive heart failure, reducing triglycerides, atheromas, total cholesterol, and increasing HDL levels. * Fasting has been found effective in the treatment of type II diabetes, often reversing the condition permanently. * Because of its long term effects on metabolism, fat stores in the body, leptin, and disease conditions associated with obesity, fasting has been found to be one of the most effective treatments for obesity. * A number of studies have found that fasting is beneficial in epilepsy, reducing the length, number, and severity of seizures. Fasting is especially effective for helping alleviate or cure childhood epilepsy. * In a 1988 trial of 88 people with acute pancreatitis, fasting was found better than any other medical intervention. Neither nasogastric suction or cimetidine were found to produce as beneficial effects as those from fasting. Symptoms were relieved irrespective of the etiology of the disease. * A number of studies have found that fasting is effective for treating both osteoarthritis and rheumatoid arthritis. Fasting induces significant antiinflammatory actions in the body and researchers found decreased ESR, arthralgia, pain, stiffness, and need for medication. * Autoimmune diseases such as lupus, rosacea, chronic urticaria, and acute glomerulonephritis have all responded well to fasting. * Severe toxic contamination has been shown to be significantly helped with fasting. Clinical trials have found that people poisoned with PCB experienced "dramatic" relief after 7-10 day fasts. decreased complement factors, decreased antigen-antibody complexes, increased immunoglobulin levels, increased neutrophil bactericidal activity, depressed lymphocyte blastogenesis, heightened monocyte killing and bactericidal function, and enhanced natural killer cell activity. * Other diseases that have responded to fasting are: psychosomatic disease, neurogenic bladder, psoriasis, eczema, thrombophlebitis, varicose ulcers, fibromyalgia, neurocirculatory disease, irritable bowel syndrome, inflammatory bowel disease, bronchial asthma, lumbago, depression, neurosis, schizophrenia, duodenal ulcers, uterine fibroids, intestinal parasites, gout, allergies, hay fever, hives, multiple sclerosis, and insomnia. * The historically lengthy claim that fasting increases life span is beginning to garner some support in research literature. Regularly repeated 4-day fasting has been found to increase the life span in normal and immunocompromised mice. * Although the use of fasting in the treatment of cancer is controversial, there is some emerging data SHOWING that fasting helps prevent cancer. Intermittent fasting (2 days weekly) has shown an inhibitory effect on the development of liver cancer in rats. * Those with porphyria. Porphyria refers to a genetic metabolic defect that affects the body's ability to manage porphyrins. Porphyrins are a group of compounds that combine with iron to produce blood, are involved in the control of electron transport systems, and, within mitochondria, are intricately involved in the production, accumulation, and utilization of energy. Porphyria can cause malfunctions in the liver, bone marrow, and red blood cells and produces a wide range of symptoms including seizures. * People with a rare, genetic, fatty acid deficiency which prevents THE INITIATION OF KETOSIS. This is a deficiency involving the enzyme acetyl-CoA, a mitochondrial fatty acid oxidation enzyme, that is essential to ketosis. Those with this deficiency who do fast can experience severe side effects, including hepatic steatosis, myocardial lipid accumulation, and severe hypoglycemia.